Located in Wester Ross on the western edge of the Highlands, there's something irresistibly appealing about the Glencarron Estate and its three cottages. It may be its Highland location with glorious views across Glencarron, where to spend the evenings watching the glen turn gold in the setting sun will create an indelible memory. Or perhaps it's the creature comforts to be found within the warm, cosy and stylish cottages. 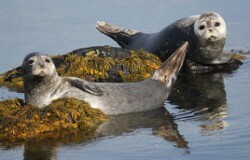 Throw in the attractive choice of activities and places to visit within easy reach of Glencarron, and it is easy to appreciate why it makes such a great holiday choice for groups of friends and families at any time of the year. Stag Lodge, is a Victorian estate worker's cottage, lovingly built using good quality local stone. With its elevated position, it captures the best views of the Scottish countryside. Warm and cosy in the winter, Stag Lodge is a lovely place to hunker down on even the frostiest of evenings, and during the warm summer months when the days are long and the nights short, this Scottish retreat is a wonderful place to watch the beautiful sunsets as the Highlands come alive in shades of gold and yellow. From the outside the cottage with its colourful red wood panelling appears disarmingly simple and unembellished; however, step inside and a totally different impression emerges. Refurbished in 2013, the cottage offers spacious, clean and comfortable rooms all tastefully decorated and finished to an extremely high standard. Stag Lodge comes comfortably equipped, offering four bedrooms, two bathrooms, a spacious lounge and kitchen/diner, fitted with everything from John Lewis white goods to champagne flutes and much more besides. It is also equipped to accommodate those planning to spend days in the mountains, walking, stalking, wading or riding. The handy utility room will help transform wet muddy attire at the day's end to warm dry ready to wear items by the following morning. The stunning 11 bedroom Glencarron Lodge is an original Victorian Shooting Lodge complete with beautiful garden and breath taking Highland views. The elegance and sophistication of the period lodge has lovingly been retained as the owners have sensitively modernised it to include the convenience of modern facilities. The lodge has two double, seven twins and two single bedrooms, which share six bathrooms, one of which is an en-suite; two cots are also available for any infants. Downstairs Glencarron Lodge has a beautiful drawing room with open fire, where everyone can come together to enjoy relaxing evenings or celebrate a special occasion. There is also a large dining room with table to seat up to 18, two games rooms featuring a pool table and table tennis and a handy children's sitting room where the youngsters can watch TV or take advantage of the WiFi. The period style oak kitchen has been sympathetically modernised and includes an oil AGA, as well as separate cooker, two dishwashers, three fridges, and a washing machine and tumble dyer. Finally the lodge has its own very useful drying room and a gun room. Hidden away in the Glenuaig Valley on the Glencarron Estate is Glenuaig Lodge. This four bedroom hunting lodge was once used by Victorian gentleman, and their servants when stalking deer on the remote hills; today it has been fully renovated to an extremely high standard for guests seeking to get away from it all. 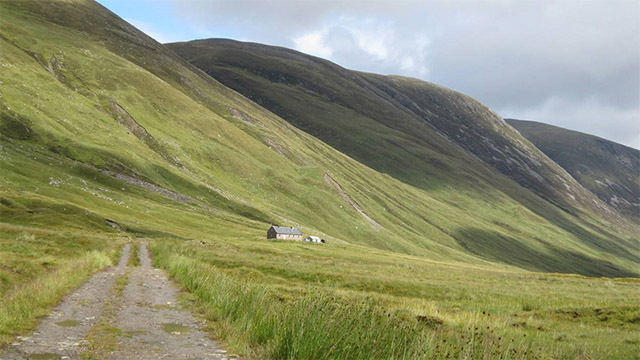 Accessible only via a 4x4 with high clearance, Glenuaig is located down a country track and enjoys a mountainous location with wonderful views, and is surrounded by beautiful wildlife, including red deer and eagles. 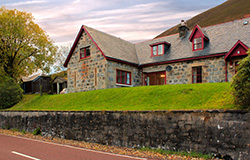 The stone exterior may seem a little plain on first sighting but it blends in beautifully with the surrounding Munros, and once inside, the interior has been wonderfully designed and it is fully equipped to ensure guests can sit back and relax in a period property that has been renovated with comfort in mind. Perfect for guests looking for a luxury property in a peaceful setting, the lodge has its own micro-hydro electricity system to guarantee it is always warm and cosy. Inside the cottage has a traditional drawing room, a large dining room, a handy drying room and a well-equipped kitchen. There are also four bedrooms, one double and three twins, which share two bathrooms. The Glencarron Estate provides the ideal base for not only walking, fishing or stalking but also for relaxing peaceful holidays in the Scottish highlands. 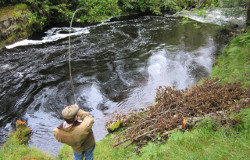 On the 12,000 acre Glencarron Estate guests can enjoy salmon and brown and sea trout fishing on the River Carron and nearby lochs. 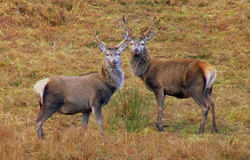 Deer stalking (whether with gun or camera), clay pigeon shooting and guided walks can also be arranged with the Estate's stalker. For 'Munro Baggers', there are four peaks over 3000 feet on the estate and eight more within an easy drive. The Glencarron Estate is within an easy, picturesque drive of idyllic beaches on the west coast, as well as the attractive villages of Applecross, Plockton and various whisky distilleries, castles and gardens for those who'd prefer to explore this scenic corner of the Highlands with the aid of a car. The Glencarron Estate lies less than an hour's drive from Inverness, three hours from Aberdeen and five from Edinburgh. Travelling from England? 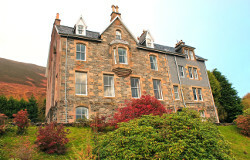 The Glencarron Estate is closer than you think! Why not fly to Inverness and hire a car at very reasonable rates? The airport at Inverness has daily flights to the rest of the UK, including London, Bristol and Birmingham, and within less than an 80-minute flight you too can be enjoying the Scottish highland scenery. We'd be delighted to welcome you to The Glencarron Estate at any time of the year. You can book online or e-mail/phone us and we'll be happy to answer your questions or help you arrange a specific activity such as clay pigeon shooting or fishing. We offer short breaks outside the school holidays, and are as popular with groups of friends as we are with families.